Mamoudou Gassama, the Malian ‘Spiderman’ in a viral video who saved a kid from falling from a balcony in France has had his French citizenship revoked. 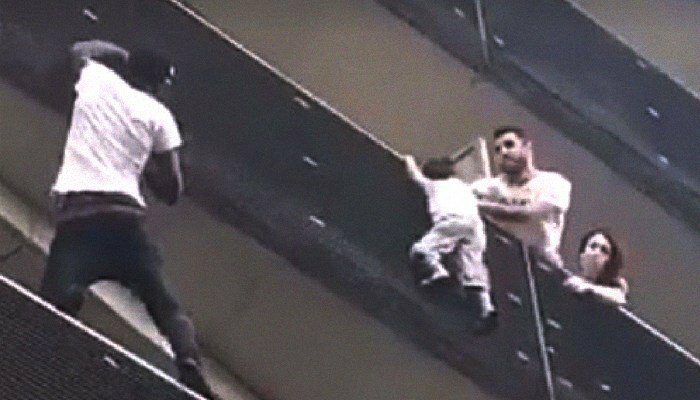 The Malian migrant who was hailed as a hero after mounting a daring rescue to save the small boy dangling from a balcony in Paris was made a French citizen. In a report by the Sûreté nationale, the National Police of France, Mamoudou Gassama’s heroic rescue was staged. According to a 4-page report delivered to the France President Emmanuel Macron on Wednesday, the father of the boy and a friend whose name was given as Jean-Pierre staged the act to monetise the video on YouTube. The report revealed that, the boy’s father, Jean-Pierre and Gassama were all employees of same company despite the ‘spiderman’ being an undocumented migrant. CCTV footage shows Jean-Pierre bringing the boy to the balcony and holding him tight as he waits on Gassama to arrive. The report advised President Emmanuel Macron to revoke Gassama’s citizenship which he did accordingly. Macron says Gassama safes deportation while while the accomplices would be prosecuted. Mr Gassama arrived in France last year, taking the long and dangerous journey to Europe via a boat over the Mediterranean to Italy.